Arihant Capital Franchise is a well known broking franchise business head-quartered in Mumbai. 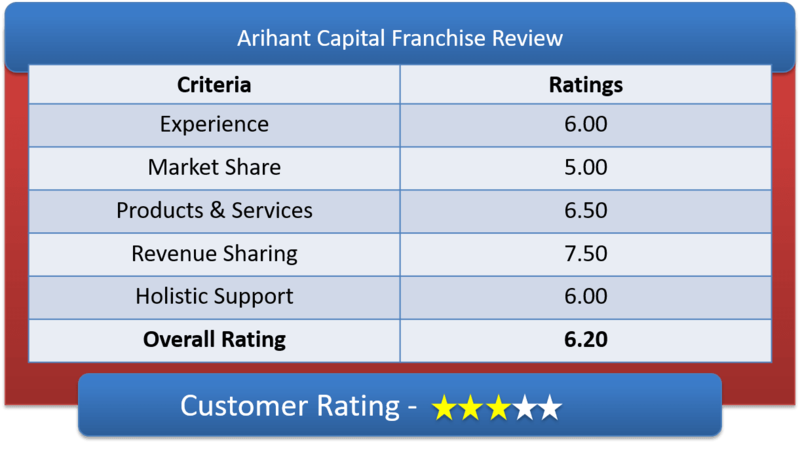 Lets have a detailed discussion on Arihant Capital Franchise Review & in-depth understanding of Arihant Capital Sub Broker offerings, Arihant Capital Franchise Revenue Sharing Models & other features of Arihant Capital Partner Program. They started as a stock broking company in year 1994 and today they are among leading brokerage houses. With customer base of some 1.258 lakhs; 760 plus investment centers and covers more than 128 cities. They have a dedicated institutional team for MF and insurances. A member of NSE/ BSE, F&O, MCX-SX/ MCX, NCDEX and has DP with CDSL so a person can trade in those segments. Also, Arihant capital provides services like Demat Account, Trading Account, Depository Services, Advisory Services, IPOs, Wealth Management Services, PMS, NRI Services & Research Reports. Client have the privilege to attach any of your Public or private bank. But Arihant Capital lacks coupling with smaller banks. One can also open the sub-broker account online merely using Aadhaar card. Independent financial Adviser or IFA. Thus Arihant Capital provides you with almost all the options to business with them. You can start at the lowest level as well and get started and rise with time. Lets have a through discussion on Arihant Sub Broker Revenue Sharing Models & their Initial Investment Amount requirement & fees. Revenue Sharing model of Arihant Capital Sub Brokership varies from 60:40 ratio to 70:30, which means a Sub Broker can keep 60-70 percent of brokerage generated and the 30-40 percentage of the brokerage generated goes to Arihant. This revenue share increase happens based on negotiation ability of the client. After a year or two when the franchise owner starts generating good brokerage amount, they can speak to Arihant managers to increase their brokerage amount up to 75 percent. Rs 50,000/- (fifty thousand only) is needed to be deposited as security amount which is refundable when a Partner exits Arihant Capital. Depending on their client base and experience one will get access to all segments to trade into with Arihant Capital. That is a plus point with Arihant Capital. A Sub Broker will spend on rent, electric bills to run the office and internet as well. Apart from refundable amount mentioned above, they also need to pay for registration Rs.2360/- (non-refundable) for each segment that they want to trade into. Once a Sub broker is registered with Arihant Capital, the broking franchise will offer training on their trading platform which will be free of cost. Although the franchisee need to own their own personal computer/ laptop. Arihant Capital also provide with advertisement material. Arihant Capital trading platforms are also provided free of cost to the franchise owner and to their client as well. Research reports are also not charged by Arihant Capital. They also provide with business cards and few more things as well. Their trading platform is Arihant Mobile App. This app for trading is fairly good but does it matches the best in the market is questionable. For marketing and branding of new franchise outlet, they provide the support with all the marketing material like banner, leaflet, posters, visiting cards, etc. For technical support, they will always provide back office support. They will provide sub brokers and their employees with proper training and update them on the tools and software up-gradations. The Franchisee also get free training on various trading platform of Arihant. They use Arihant ODIN Diet and NOW. Arihant Capital also provides other important tools like CRM to make daily and weekly report for a faster client handling. Transparent and ethical business with customer, nothing hidden. Good range of investment needs. How to become partner with Arihant? Get the help from a chartered accountant to ease the registration process. Follow the guidance and T&C of the company for different type of franchises. Generally, it takes 12 working days for the franchise registration process to complete and get the franchise code.